Since its launch, HTC’s Vive has remained my favourite high-end virtual reality headsets because its full 360-degree room-scale tracking is unparalleled in the industry — at least so far. That said, Facebook’s Oculus Rift manages to surpass the headset in the comfort, build quality and sound categories. 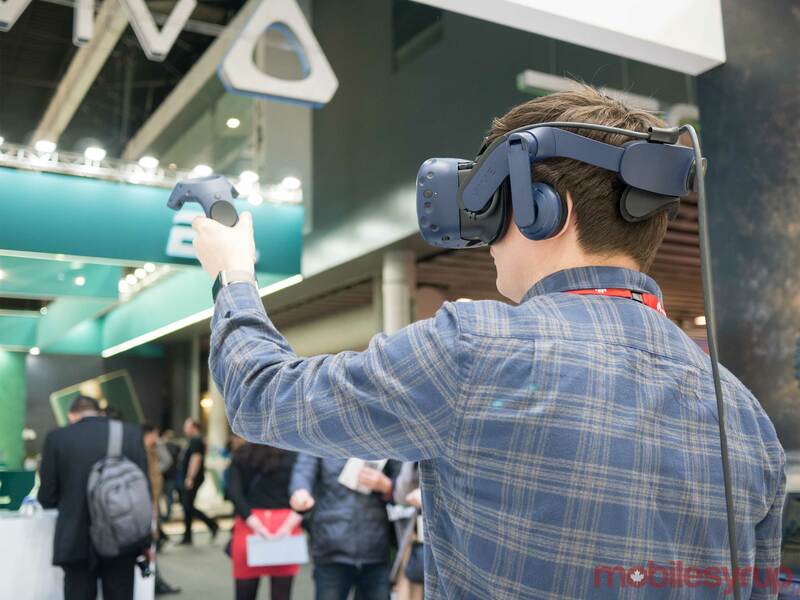 After going hands-on with HTC’s second-generation Vive Pro at Mobile World Congress 2018, it’s obvious the second iteration of the Taiwenese company’s headset is designed to bring the device up to par with the Oculus Rift in those particular categories. From a pure experience perspective, the most significant change with the Vive Pro is the headset’s 2K resolution; specifically, 2880 x 1600 pixels and 615 dpi per eye. This amounts to an impressive 78 percent increase over the current generation HTC Vive’s 1080 x 1220 pixels per eye. During my brief amount of time playing a relatively uninspired on-boarding warehouse instructional ‘game,’ I was impressed with how clear the display looked in comparison to my experience with the first-generation HTC Vive, Oculus Rift, or even the PlayStation VR. While the ‘screen-door,’ pixelated effect was still there, it was minimized to an extent that it was barely noticeable. It will be interesting to see how many current games are set to be updated to support the higher resolution. Given the process of increasing the resolution of images isn’t typically intensive from a development perspective (at least in some cases), it’s likely many VR content creators will opt to support the Vive Pro’s greater resolution — it’s impossible at this point to know for sure though. The Pro’s built-in headphones — which were sold separately for the first-gen Vive as the ‘Deluxe Audio Strap’ — are very comfortable and sounded better than I expected. They also have a lot in common with the Oculus Rift’s built-in headphones. 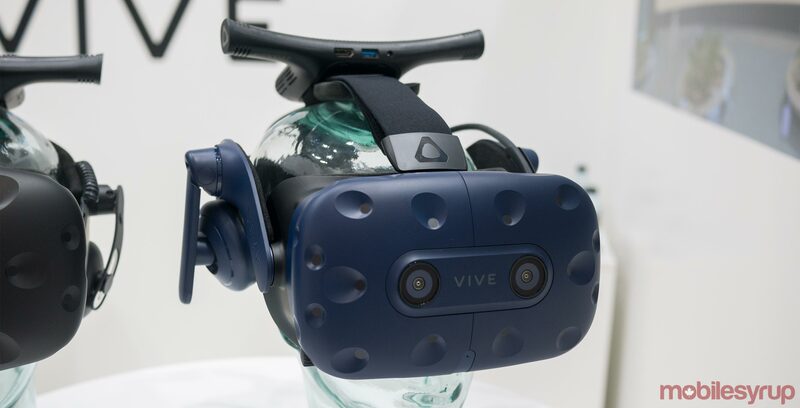 Other improvements include the fact that the Vive Pro is lighter than its predecessor, which makes the headset more comfortable to wear for extended periods of time. The Vive Pro’s colour has also shifted to a dark grayish blue from a light grey, though I was only able to notice the change after viewing both headsets side-by-side in a bright room. The other major addition is a second front-facing camera, though HTC hasn’t revealed exactly what it intends to use the camera for. It’s likely that it could be adapted to run augmented reality-like experiences on the headset at some point in the future. Finally, while the Vive Pro features new Lighthouse sensors and controllers, it’s also backward compatible with the first-generation Vive’s accessories From a backward compatibility standpoint, this is a great move by HTC. This means it’ll be possible to save a few dollars on the Vive Pro by only purchasing the headset, rather than a complete bundle that includes the controller Wands and Base Stations. The Vive Pro’s new Lighthouse sensors are wireless, but the headset’s controllers felt identical to the first-generation Vive Wands, at least as far as I could tell. During my time with the Vive Pro, the headset was also setup with the TPCast-made wireless adapter. The experience was seamless and I didn’t notice any slow-down or lag. With all that said, it’s clear the Vive Pro isn’t a radical departure from the first Vive in terms of design. One interesting demo shown off in HTC’s booth featured a custom-built PC capable of powering multiple HTC Vive headsets at once, complete with a built-in server. Four players were simultaneously in virtual reality, shooting virtual weapons. While an eager HTC rep boasted about the headset’s potential with ‘defence contractors,’ I could see how a pricey set-up like this could change the way VR arcades currently operate. I’m impressed with the HTC Vive Pro, though it’s clear the headset isn’t the Vive 2. 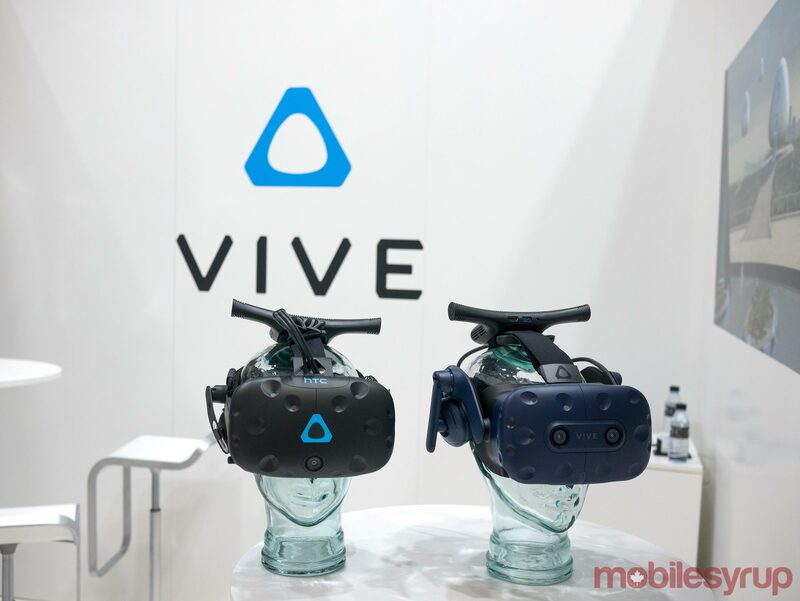 It includes minor improvements over the first Vive and solves some of the headset’s most significant shortcomings. 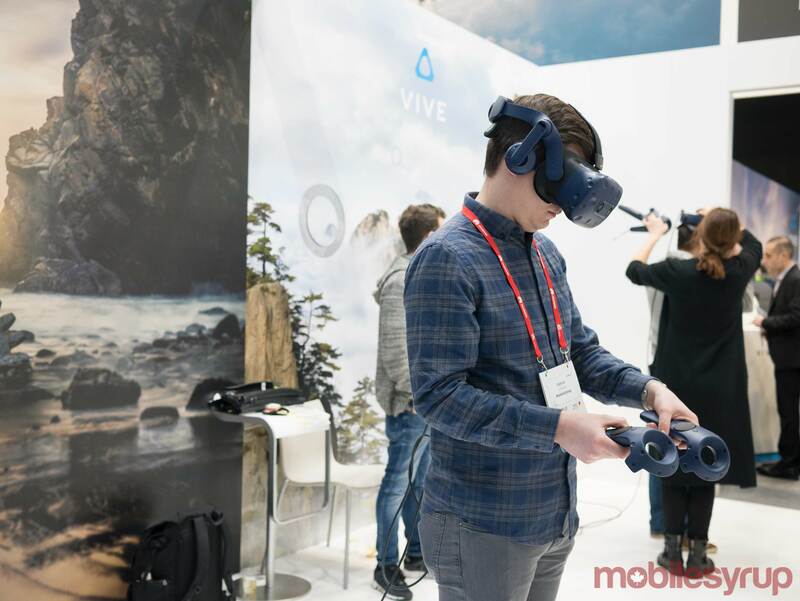 It’s unclear when the Vive Pro will be released in Canada or how much it will cost, but we’ve reached out to HTC for clarification. 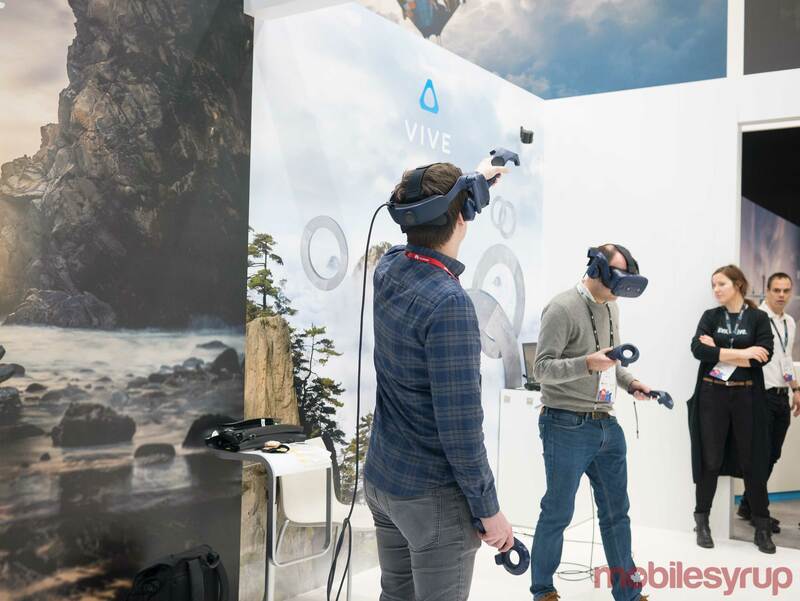 In the U.S., the Vive Pro headset is rumoured to be priced somewhere in the $800 USD range ( approximately $1,012 CAD), though official pricing still hasn’t been revealed. Update 02/27/18: An earlier version of this story stated that the Vive Pro will cost $799 USD. This information was based on rumours and official pricing has not been confirmed by HTC.